Beautifully engraved Scarce SPECIMEN certificate from the Planet Hollywood. 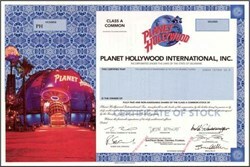 This historic document was printed by the American Banknote Company and has an ornate border around it with a vignette of the company logo and a Planet Hollywood restaurant. This item has the printed signatures of the Company’s President Robert Early, Chairman of the Board Keith Barish, Demi Moore, Bruce Willis, Arnold Schwarzenegger and Sylvester Stallone. Arnold Schwarzenegger is currently running for governor ( Total Recall 2 ). 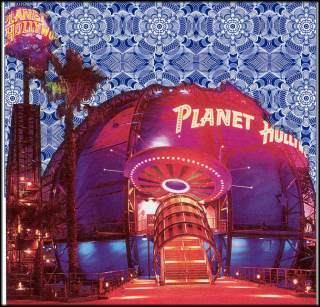 On October 11, 1999, Planet Hollywood International, Inc. announced that it would file petitions under Chapter 11 of the United States Bankruptcy Code in Delaware on October 12, 1999. On October 12, 1999, the Company and twenty-five of its operating subsidiaries filed voluntary petitions commencing cases under Chapter 11 of the United States Bankruptcy Code with the United States Bankruptcy Court for the District of Delaware. The cases are being jointly administered under the case name IN RE: PLANET HOLLYWOOD INTERNATIONAL, INC., et. al., Case No. 99-3612 (JJF). The Company and its subsidiaries continue to operate their businesses as debtors-in-possession in such cases. A copy of the voluntary petition for Planet Hollywood International, Inc. is filed as Exhibit 2.1 herewith and incorporated herein by reference. The Honorable Joseph J. Farnan, Jr., United States District Judge, will preside over the cases. 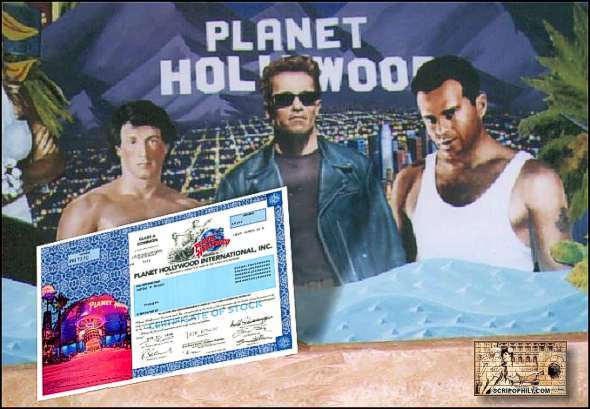 On January 27, 2000 Arnold Schwarzenegger said he is ending his five-year contract with Planet Hollywood International. As an investor, the actor was the public face of the troubled restaurant chain, along with fellow box office heavyweights Bruce Willis, Demi Moore and Sylvester Stallone. The actor said he has sold his interest in the Orlando-based company. "It was lots of fun and very challenging to come up with and develop the celebrity restaurant concept on an international level," he said in a statement. "Of course, I am disappointed that the company did not continue with the success I had expected and hoped for."